This post was originally published on July 12, 2010. Creating soap opera in our lives is a symptom of Resistance…Sometimes entire families participate unconsciously in a culture of self-dramatization. The kids fuel the tanks, the grown-ups arm the phasers, the whole starship lurches from one spine-tingling episode to another. And the crew knows how to keep it going. If the level of drama drops below a certain threshold, someone jumps in to amp it up…It’s more fun than a movie. And it works: Nobody gets a damn thing done. I laughed out loud when I read that, mainly because I realized that I’ve had my own Starship Resistance miniseries playing over here. “I don’t even know why I bother to write at all!” I’d announce as I went to start work on the book or some other writing deadline. “I just can’t get the words out! It’s all a waste! THIS ENTIRE PROJECT IS DOOMED!” And, with that opener, I’d drag my friend/husband/babysitter/UPS delivery man into a tedious, belabored conversation about my life as a tortured writer (hoping that nobody notices my liberal use of the label “writer”) while my cursor sat motionless on the screen, not one new word appearing on the page. Not all “drama” is bad, of course. I love how the Christian life makes everything so exciting; how every day is a great battle, and the truths of the faith are better than the best fairy tale. It’s also normal and healthy to have strong reactions to intense events (in other words, don’t expect me to lay off the caps lock key next time I see a scorpion). And then there are things like clinical depression, where you may have stronger reactions to situations due to serious medical issues. I think the primary difference is that Resistance drama is ego-focused, whereas the healthy ups and downs of the spiritual life are God-focused. When I get mired in bad drama I withdraw into a tiny solar system with my blazing ego at the center, where I fixate on who said what that offended me, whether people will think what I’m doing is great or terrible, whether what I do is good or bad in comparison to other people’s work…and I give nothing back to the world. I’m a black hole. Paralyzed by Resistance. Whereas on the occasions that I’m swept up in positive drama, I’m more focused on God than myself, more concerned with helping people than comparing myself to them, and, most tellingly, I’m still creating. I’m still giving something back to the world. Now that I’ve recognized this tendency, I’ve been getting a lot more done, especially in creative type endeavors. I’m learning to identify those moments when I’ve brought my life to a screeching standstill by turning it into another thrilling episode of Starship Resistance. It’s helped me to distinguish between when there are legitimate issues that I need to address, and when it’s time to shut up, stop the theatrics, and get to work. CAVEAT: Even though Pressfield is not a Christian, as a Catholic I found 90% of The War of Art to be dead-on accurate and life-changingly, put-down-the-book-in-mid-sentence-and-go-tell-everyone-you-know-to-buy-a-copy good. Since it deals with spiritual matters it’s one you’ll want to read “with discernment, ” as they say, but I do strongly recommend it. I love that! You are a treasure. It just goes to show that voices of experience outside the church can teach us much as well. Of course, the existence of evil is readily verifiable to anyone. Perhaps, Pressfield will appreciate the bigger drama in time. My solution to “drama” of any form is to try to get in front of the Blessed Sacrament and dump all my woes and issues into Jesus’ hands and let Him handle them as He sees fit. 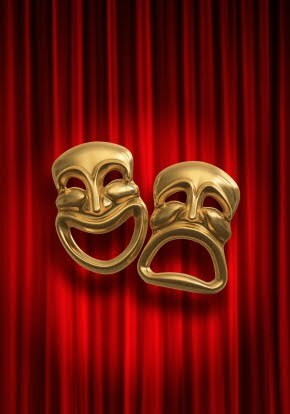 I first heard the word “drama” several years ago as an acting student in NYC at the American Academy of Dramatic Arts. I used to think drama was solely something reserved for the stage, but I guess it’s safe to say that life itself is full of it – good, bad and everything else in between! That same kind of “drama” throws a wrench into religious-community living! How true this is! We are who God has created us to be; our job is to become it. I guess you have found your calling, Jennifer, if even your petulant inner drama can be employed to edify others. Keep it coming. I’m so glad that you posted this. I’ve been thinking about ‘spiritual warfare’ since you reminded us of it the other day. I’m going straight to order this book! So interesting and well timed! My site gets an enormous number of hits for search terms like “don’t be a drama queen” (oddly, because of a post about Anne of Green Gables! ), and my friend and I were just discussing whether some people attract drama more than others (answer: Yes). That book sounds fascinating! And while I know you don’t want to actually be living the soap opera Starship Resistance, your commentary on life-as-ego-drama is too, too funny! Love this! My dad and I talk about how movies have a distinct plot line with large roller coaster ups and downs. Life kind of just hangs out in the middle, but the more media we expose ourselves to, the more we feel like our lives need to have these huge valleys and peaks. Also, diggin’ the word “caterwauling”! Maybe you know this already, but this last week I heard that scorpion venom is being used to treat some kind of brain cancer. So the scorpions are a treasure just waiting to be discovered! I know, you are not convinced. To be honest, I am not convinced either, since I heard this on a PBS podcast which is seemingly unable to check their facts, pronounce almost anything correctly, and which passes judgement on just about any place, time in history, idea or news based on their own limited world view. Anyhow, I have a question for you. I love your blogs – here and elsewhere. But HOW do you find time to read the zillions of comments, and read books, go to conferences and interviews AND be a mom? I don’t get it. My kids are grown, I only see my grandchildren a few times a week, and I still can’t get time to read all the stuff I want to read – both blogs and books. True, I do work part time, but still… how do you do it?! Do you have a bouncy castle that you lock your kids into for eight hours a day? A behind the scenes staff of nannies? Well, however you do it, I appreciate your work. Thanks. He has another great book called Do the Work, which he was offering for free on Kindle. I read that book and immediatly started writing my childrens book I’d been dreaming about. I needed this SO MUCH, Jen! Thank you! I can totally relate to bad drama. I grew up in a very volatile household where most things were contentious and dramatic. It seemed like every day was a Spanish Soap Opera. As I came to my faith I began to rebel against this lifestyle. As I came back to my faith I craved the still, silent voice of God amidst the daily chaos. I didn’t want, “Bad drama” anymore. I wanted good, saintly, purposeful drama. Thanks for articulating his distinction so clearly. As per usual, love your well-crafted metaphors. It changes everything depending on what we’re focusing on. Focusing inward on self, without the emphasis being on our having been created in God’s image, often produces misery and disillusionment. Looking at the Lord, His Presence in the world, in our hearts, and in the lives of others, produces much different results, more along the lines of love, compassion, and mercy. Thanks for the book recommendation. I’m a voracious reader and am always looking for new, life-changing books to devour. I just wanted to say thank you for choosing to repost this on the day that you did a few weeks ago. I actually read this right as I was procrastinating on an article I desperately needed to finish that very night. The good drama versus bad drama was exactly what I needed to hear so I could whip myself into shape and focus on getting what I needed to write down on paper. I don’t know what (or Who) made you decide to repost this, but know that it was much appreciated and has given me food for thought ever since. Keep up the excellent insights!